Back when the internet was all just fields and Twitter was populated entirely by technology journalists and twenty-somethings skiving off work, celebrities were a rare sighting. Nowadays, normal folk can’t get a word in edgeways. If you can’t beat them, join them! Which is why we’ve put together this handy guide to behaving like a Famous on Twitter. if you want to be mistaken for a famous person, it’s important to make sure you get your account verified. How can everyone be sure that I REALLY AM Katie Lee (and not just some little person who happens to have the same name as me)? That little blue logo is my way of letting you all know that I’m pretty gosh darned impressive. No celebrity worth his or her salt actually writes a proper bio. While the rest of us are trying to sum up our entire personality in 160 characters without sounding too needy, dull or psychotic, celebrities opt for a little bit of nonsense. Typically, it’s either a piece of false modesty or it’s some piece of witty folly. Either way, it shows 1. you’re so famous you don’t NEED to write a proper bio 2. you’re witty and self-effacing and aren’t desperately seeking followers. Don’t bother replying to the hoi polloi – unless you’re condescending to retweet something nice they’ve said about you so that everyone can see your reply. Instead, chat to other famous people over the top of everyone’s heads. It doesn’t have to be witty or interesting: feel free just to discuss some new shoes you have bought. If possible, try to talk to at least three or four other celebs to let us know how unstarry our own conversations are. A lot of celebrity Twitter feeds have a faint whiff of endorsement fees about them. So you just got your floor done by an amazing firm specialising in eco-friendly, recycled rubber tyres from the US (air freighted here for your pleasure)? Tell everyone! We love to know that we can now enjoy paying full price for the same product you got at cost in return for that tweet. Some of these suggestions are for fairly standard celebs – writers, journalists and comedians who are skiving off proper work. If you want to REALLY show the world how famous you are, have someone else tweet for you. Obviously, I am just bitter and jealous because when there were only twelve people on Twitter, we thought we were IT. Now we know we are not. 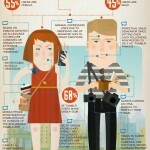 How do YOU pretend to be famous on Twitter? 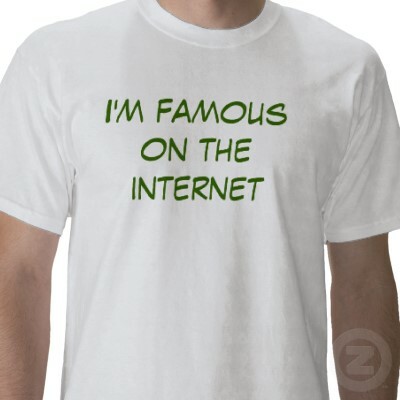 Pic: I’m Famous on the Internet T-shirt from Zazzle. You can follow @dorkadore or @shinykatie on Twitter. Neither one is famous. Can I add “Get yourself a hashtag”? Worked for Bieber…and Kony. I’m told you haven’t made it on Twitter until someone has created a parody version of you. Thankfully this has already happened to me, so I’m fine.